When you think about red wines from Italy, Sangiovese right away pops to mind, and maybe Nebbiolo for those of the Barolo advice. Italy is rich in local grape kinds, but a number of of them are limited to very small territories inside the country and are exported in minor amounts, if at all. One of the best of the indigenous Italian kinds is Sagrantino. 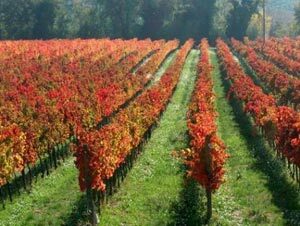 Sagrantino is local to Umbria, recognized as the "green heart of Italy" due to the fertile watercourse valleys located in it. Geographically, it is the single territory in Italy that does not border the sea or another nation. Wine production has a long past here, but commercial wine making is a quite recent phenomenon. Of the 13 DOC areas in Umbria, 11 of them were formed subsequent to 1980. For the most part of the production (70% of the DOC production) the region derives from Orvieto, a white wine which is gradually becoming more and more present within the foreign marketplace. Virtually all of the Sagrantino grown in the world is cultivated in the township of Montefalco that is pretty much in the heart of Umbria. In 1992, Sagrantino di Montefalco was brought to DOCG class, the uppermost excellence rank in the Italian system. To meet the requirements for the DOCG mark, wines from this district must be made with 100% Sagrantino grapes and be matured for 30 months with at least 12 of those inside oak barrels, prior to being commercialized. This extended aging time is required as Sagrantino is a powerful little grape. It's concentration of tannins is amongst the highest in the world and it usually demands some longer aging time in the cellar before it is accessible. These wines are not low-cost anywhere owed to the very restricted production. In the glass, the wine has an opaque, dark black heart and a violet edge. It coats the wineglass as it is swirled around. It is intensely drenched and strong. On the nose, the wine is a tiny timid, but there are smells of cedar and candied black cherries, smoke, and black plums. In the mouth, it is full-bodied and extraordinarily tannic. The tannins are dense, but they actually do not hinder the fruit flavors too much. The aromas are followed well in the mouth with a lot of smoky, mature black fruits all over the palate. If it wasn't for the depth of the fruit, this would be a very austere wine, but as it is, it's merely kind of tough and burly. An aged cheese to go along with this is just about perfect. If you happen to stumble across one of these wines and have some money to spend, I believe you won't be dissatisfied. It's not something I'd look to glug down consistently, however it's an exceptional, high class wine that's a wonderful match for rich main courses.